A total of 31 records matched your search. 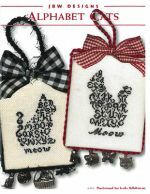 Alphabet Cats from JBW Designs is stitched on 28ct Fairy Dust for the kitten and 30ct Antique White for the mom or fabrics of your choice with stitch counts of 38w x 52h for the kitten and 45w x 65h for the mom. One Crescent Colours, Weeks Dye Works or DMC floss is used. 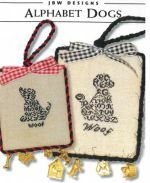 Alphabet Dogs from JBW Designs is stitched on 28count Country French Linen or a fabric of your choice with a stitch count of 43w x 69h for the Momma Dog and 33w x 43h for the Puppy using one Weeks Dye Works with DMC alternative or fiber/color of your choice. 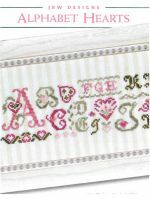 Alphabet Hearts from JBW Designs is stitched on 32 count Neutral Parisian Stripe from Fabric Flair or fabric of your choice with a stitch count of 208w x 40h using 3 Crescent Colours, 1 Weeks Dye Works and 2 Sampler Threads, DMC alternatives are provided. 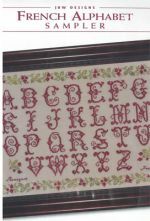 Alphabet Pumpkin from JBW Designs is stitched on 29 Count Glenshee Linen or a 14/28 count fabric of your choice with a stitch count of 52w x 45h using either Sampler Threads or Weeks Dye Works floss with a DMC conversion provided. 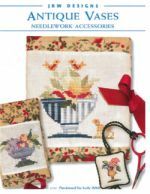 Antique Vases from JBW Designs is stitched on 32count Off White linen with various stitch counts for the Scissor Fob, Needlecase and Needlebook and uses Crescent Colours, Weeks Dye Works or Sampler fibers with DMC conversion. 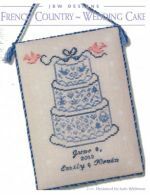 Antique Vases Sampler from JBW Designs is stitched on 16/32count Ivory fabric with a stitch count of 203w x 155h using Crescent Colours, Weeks Dye Works or Gentle Art fibers with DMC conversion available. Beach Bound from JBW Designs is stitched on 30 count Ivory Northern Cross Linen or a fabric of your choice with a stitch count of 117w x 51h using DMC floss. 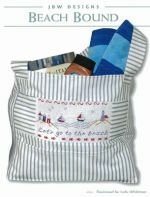 The pre-finished Beach Bag is availabe fro JBW Designs. 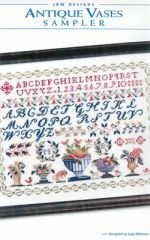 French Alphabet Sampler from JBW Designs is stitched on 30ct Parchment Legacy Linen or fabric of your choice with a stitch count of 261w x 175h using either 2 colors of Weeks Dye Works or two colors of Gentle Art Sampler threads, with DMC alternative available. 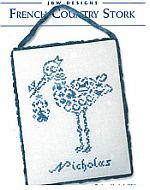 French Country Angel from JBW Designs is stitched on 14/28 count White with a stitch count of 69w x 62h using either Sampler Threads or Weeks Dye Works floss with a DMC conversion provided. 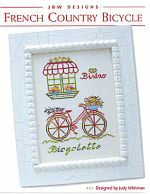 French Country Butterfly from JBW Designs is stitched on 14/28 count Ivory with a stitch count of 62w x 62h using Weeks Dye Works floss, Sampler Threads or Crescent Colours with a DMC conversion provided. 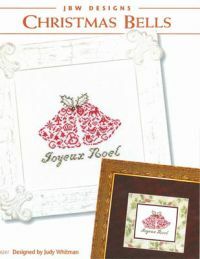 French Country Christmas Bells from JBW Designs is stitched on 16/32count White with a stitch count of 75w x 65h and uses Crescent Colours, Weeks Dye Works or DMC threads. 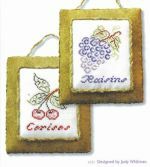 French Country Fruits by JBW Designs has 2 designs stitched on 28ct Stone or fabric of your choice. Cherries stitch count is 39w x 55 high and uses 6 Crescent Colour or Weeks Dye Works hand-dyed threads while Grapes stitch count is 45w x 56h and uses 5 Crescent Colours or Weeks Dye works. DMC conversion is provided. 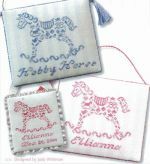 French Country Hobby Horse by JBW Designs is stitched on 14ct or 28ct Antique White or Blue Parisian Stripes or Pink Parisian Stripes from Fabric Flair with a stitch count of 78w x 65h using either a Crescent Colour or Gentle Art hand-dyed threads or DMC. The Parisian Stripe fabric is available for $9.90, please specify pink or blue. French Country Pear from JBW Designs is stitched on 14/28 count Ivory with a stitch count of 49w x 70h using Weeks Dye Works floss with a DMC conversion provided. 2 color variations are provided. 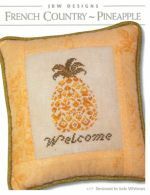 French Country Pineapple from JBW Designs is stitched on 16/32 count fabric from Lakeside Linen or fabric of your choice with a stitch count of 56w x 67h using Crescent Colours fiber or fiber of your choice. 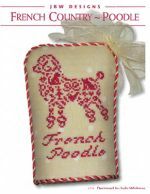 French Country Poodle from JBW Designs is stitched on 32 count French Polka Dot from Fabric Flair or fabric of your choice with a stitch count of 48w x 69h using Weeks Dye Works or Crescent Colours, with DMC alternative available. 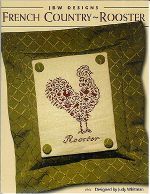 French Country Rooster from JBW Designs is stitched on 29 count Glenshee Linen Natural or a 14/28 count fabric of your choice with a stitch count of 65w x 94h using Weeks Dye Works floss or Sampler Threads with a DMC conversion provided. 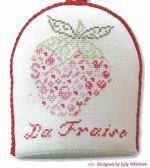 French Country Strawberry by JBW Designs is stitched on 14ct or 28ct Antique White with a stitch count of 57w x 64h using 5 Crescent Colours or 5 Weeks Dye Works hand-dyed threads with DMC conversion provided. French Country Umbrella from JBW Designs is stitched on 32 count French Polka Dot from Fabric Flair or 28 count Baby Lotion with a stitch count of 57w x 73h using Crescent Colours with DMC alternative available. French Country Wedding Cake from JBW Designs is stitched on 32ct French Polka Dot Linen from Fabric Flair or a fabric of your choice with a stitch count of 62w x 70h using 5 Crescent Colours with DMC alternative available. 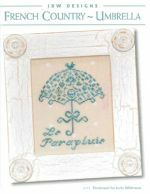 French County Witch from JBW Designs is stitched on 28 count Antique Ivory or a fabric of your choice with a stitch count of 85w x 74h using one color of Classic Colorworks with DMC alternative, a fiber/color of your choice can be used. 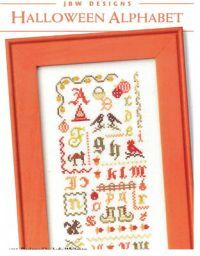 Halloween Alphabet from JBW Designs is stitched on 32 count French Polka Dot fabric from Fabric Flair or fabric of your choice with a stitch count of 61w x 150h using Colorworks Weeks Dye Works and Sampler Threads with DMC alternaives. 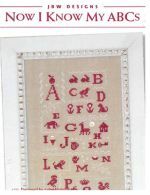 Now I Know My ABC's from JBW Designs is stitched on 14/28count Natural from Fabric Flair or a fabric of your choice with a stitch count of 62w x 166h using Weeks Dye Works fiber with DMC alternative. 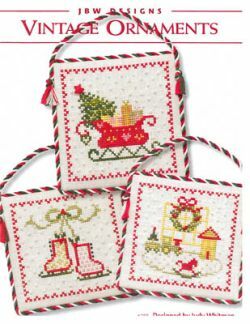 Embellishment pack of buttons is included. 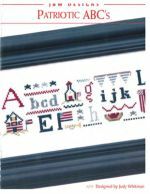 Patriotic ABC's from JBW Designs is stitched on 32ct French Striped Linen from Fabric Flair or a fabric of your choice with a stitch count of 205w x 39h using 2 Crescent Colours and 6 Gentle Art Sampler Threads with DMC alternatives available. 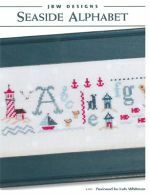 Seaside Alphabet from JBW Designs is stitched on 32count French Polka Dot fabric from Fabric Flair or a fabric of your choice with a stitch count of 250w x 33h using your choice of Weeks Dye Works Classic Colorworks, Sampler or DMC fibers. 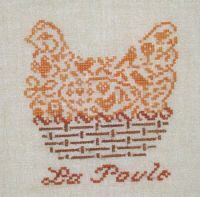 The French Hen from JBW Designs is stitched on 29 count Glenshee Linen Natural or a 14/28 count fabric of your choice with a stitch count of 65w x 66h using Weeks Dye Works floss or Crescent Colours with a DMC conversion provided. 2 color variations are provided. 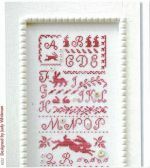 The Rabbit Alphabet by JBW Designs is stitched on 14ct or 28ct Antique White with a stitch count of 76w x 207h using either a Crescent Colour, Weeks Dye Works hand-dyed threads or DMC. The buttons are included with this pattern. 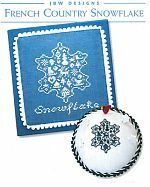 Vintage Ornaments from JBW Designs includes 3 Christmas ornaments stitched on 16/32 count Antique White with stitch counts ranging from 47w x 47h to 51w x 51h using Crescent Colours and Weeks Dye Works fibers with DMC conversion. A star button is included.